The GoldMine 2018.3 HF2 release address issues identified in prior GoldMine CRM updates. The GoldMine 2018.2 HF2 release includes an updated Redemption Library and fixes to issues previously identified in the CRM's 2018.2 release. 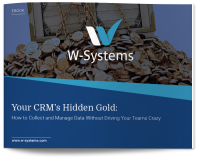 The GoldMine 2018.2 HF1 release fixes issues previously identified in the CRM's 2018.2 release. The GoldMine 2018.2 release includes improvements to password validation, default https usage, and more. It also addresses issues identified in previous versions. GoldMine 2018.1 HF 2 includes an updated version of Chilkat and fixes to issues identified in previous versions. GoldMine 2018.1 HF 1 release includes support for the UTF-8, ISO-8859-1, and 8859-15 charsets. It also addresses issues identified in previous versions. GoldMine 2018.1 release includes UI improvements to GM Premium, GM Web enhancements, Constant Contact integration upgrades, fixes to issues identified in previous versions. GoldMine 2017.1.3 release includes fixes to GMGoogleSync, Outlook Link, cloning primary field views in Record Types Admin, among others. GoldMine 2017.1 Hot Fix 2 release includes fixes to linking email addresses with an apostrophe and a comma, setting filters, Constant Contact campaigns, among others. GoldMine 2017.1 Hot Fix 1a release includes fixes for privilege errors when the Outlook Link is installed as well as upgrades to GoldMine Premium Edition and GoldMine Link for Microsoft Outlook. GoldMine 2017.1 Hot Fix 1 release includes the ability to encode emails using character set value and GoldMine Link for Microsoft Outlook updates. GoldMine 2017.1 release includes a new default landing page after logging in with a series of sections, a new page containing a tabular view of pending emails for the logged user, among others. GoldMine 2016.1.6 release includes the ability to run or record macros on newer Operating Systems, starting with Windows 7. GoldMine 2016.1.5 release includes hotfixes for French, German and Danish characters corrupt in the email headers as well as many other improvements. Goldmine 2016.1 release includes functionalities added since 2015.2 release. GoldMine 2015.2.4 release includes the ability for the GoldMine Administrator to control the default values for Date and Time or User in the Complete Activity window by inserting entries into the environment table. GoldMine 2015.2 release includes a new responsive layout that is touch-sensitive and provides easy navigation to key elements. You can now access GoldMine functionality from a web browser on desktops, tablets or smartphones. GoldMine 2015.1.5 release includes diagnostic logs for GoldMine Plus for MS Office are now user specific. GoldMine 2015.1 release includes functionality added since GoldMine 2014.2 release. GoldMine 2014.2.4 includes the locations of the Code and Result fields have been swapped in the Complete activity window in GoldMine Web. GoldMine 2014.2 release allows you to access GoldMine data in real time via a web browser with GoldMine Web and provides basic contact management functionality and a new user interface. GoldMine 2014.1.7 release includes the addition of a search button to GoldMine Mobile. GoldMine 2014.1 release includes an integration with Google Apps that provides bi-directional synchronization between your Google Apps calendar and your GoldMine Calendar. GoldMine 2013.1.5 release includes the ability to double-click a Case on a contact record’s Cases tab to open the selected case in the Service Center in detail view without resetting the Service Center list view. GoldMine 2013.1 release includes support for 32-bit editions of Microsoft Office 2013 and includes an integration with the popular email marketing service Constant Contact.